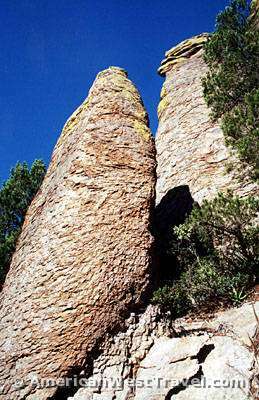 Chiricahua National Monument offers an excellent network of well-marked (photo, left, note the lizard on top of the left post) hiking trails. They are laid out such that several one-way loop trips are possible. The largest loop trip is just over ten miles and allows you to visit the park's highlights, the Heart of Rocks and Echo Park. 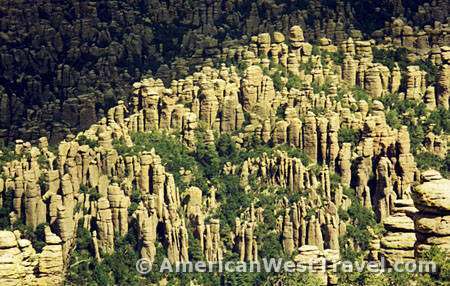 The Heart of Rocks is a huge badland of fanciful rock formations. The trail cuts through the badland in almost maze-like fashion taking convoluted twists and turns through narrow slots and openings in the rocks. 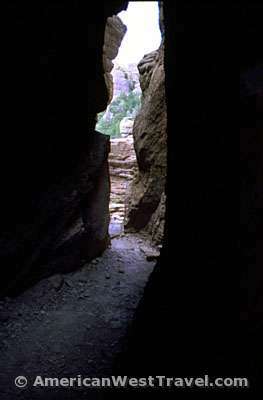 Echo Canyon offers a trail which is almost like being in a tunnel. However the entire loop provides a wide variety of terrains. We walked through quiet, shaded valleys, deep in woods. We passed open plateaus with the "big" views. 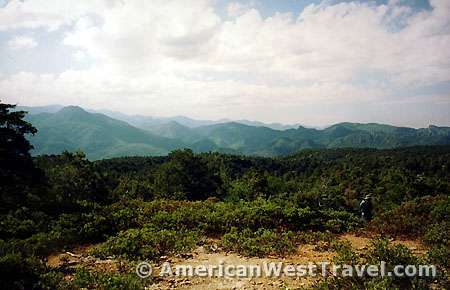 The elevation of the trails ranged from 5,980 feet to 7,010 feet. So there were some challenging ups and downs. 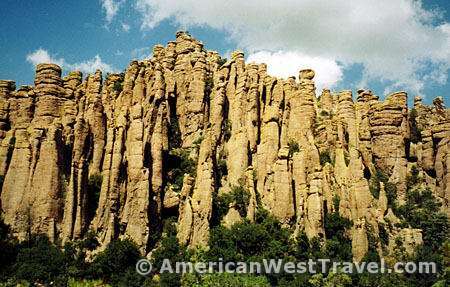 The entire trail system is within the Chiricahua Wilderness Area and is therefore pristine. There are no impacts from grazing or logging. No evidence of civilization besides the trail and the signs. Very few hikers on the trail. The thing I notice most in such places is the silence. Dead silence, except for the occasional (and inevitable) plane, the occasional call of a bird. 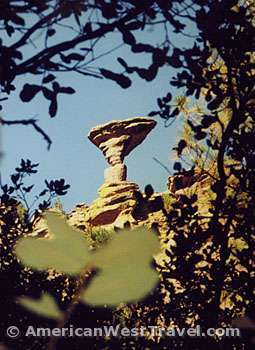 The photo, near left, provides a peek of bizarre Mushroom Rock from deep in the woods. 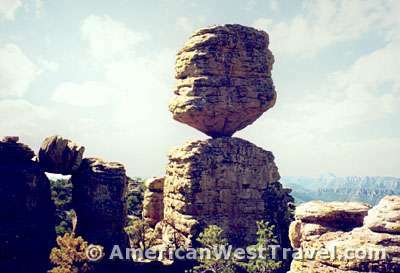 The peculiar nature of erosion causes numerous instances of "balanced" rocks where a large rock formation seems to be balanced on a tiny pedestal. The rocks are not really balanced. Rather, the column is especially eroded at a weak spot. 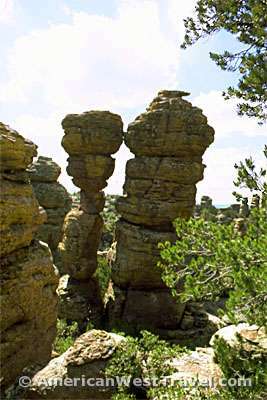 At right is the park's most well-known formation, Big Balanced Rock. Its ultimate fate is the same as the column to its left. 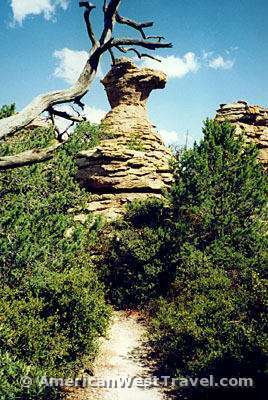 When the erosion is sufficient, the cap will collapse. 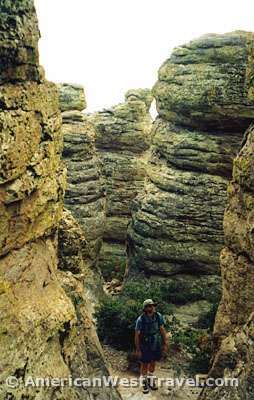 The photo, left, shows a plateau en route to the Heart of Rocks which lies in a shallow valley. 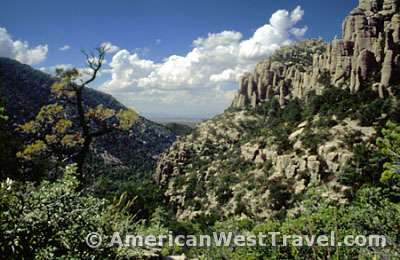 The beautiful vista has the Chiricahua Mountains marching to the horizon. Big Balanced Rock was a short distance further up the trail. The beautiful Heart of Rocks vista near the top of this page was taken from the overlook near Big Balanced Rock. The photos above come from the Heart of Rocks. The strange scenery ranges from fanciful formations such as the Camelhead, far left, to narrow slots such as shown, far right. These maze-like stretches required close attention to avoid losing the trail. 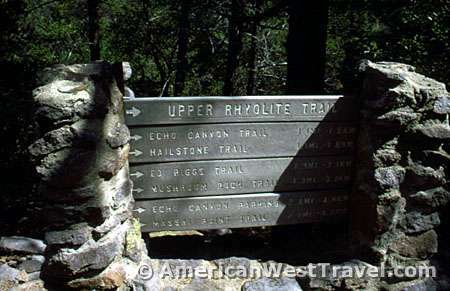 After the Heart of Rocks, the trail drops sharply towards Rhyolite Canyon, and we are back in deeply shaded woods. 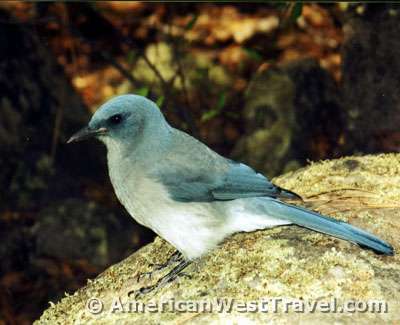 A very friendly bird (right) poses for a really close closeup. Soon we are heading uphill again towards Echo Park. The last tough stretch, all in the sun, reuqires a sharp hike up the side of the mountain. The positive side is some excellent vistas on the way up. In the photo, below right, Rhyolite Canyon is in the center, the pinnacles near the front of Echo Canyon are at right, and the open desert can be glimpsed in the distance. 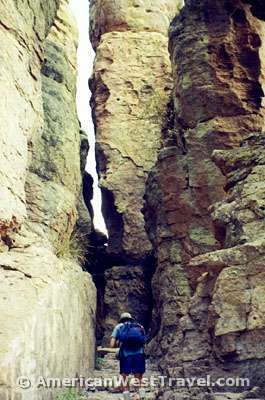 The towering pinnacles of Echo Canyon are perhaps more impressive than Heart of Rocks, especially at the entrance to Echo Canyon (photo, below left). We stop in a small glade for lunch after passing these pinnacles. We've been on the trail for about four hours at this point and have less than two miles remaining. This is the best time in a hike. The hard part is over, and it's still early in the afternoon. Now we can linger and enjoy the day, enjoy the place. The Echo Park segment has taller formations than Heart of Rocks, more tightly packed, and for a short distance is almost tunnel-like. It has a different personality. Below are some scenes from Echo Park. From here, it is a short walk to the parking lot. We start to see a few tourists out for a short jaunt, and we make the always sad transit back into civilization. Proceed to Chiricahua National Monument - Overview.